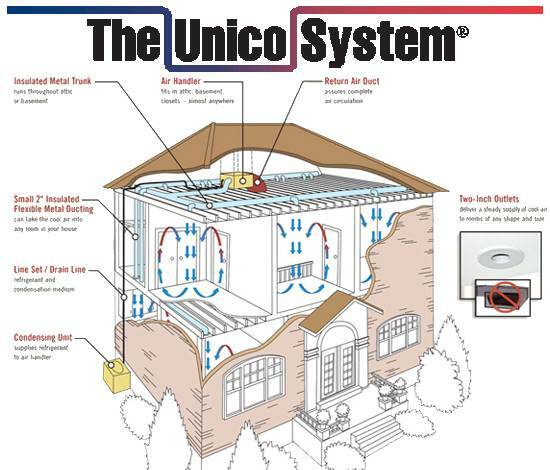 Unico Heating and Cooling systems are ideal applications where no distribution ductwork exists, and customers want to maintain the aesthetics of their home. The Unico system allows us to run small 1- to 5-inch air distribution socks throughout the walls of a home, terminating in different directions for evenly distributed conditioned air. Unico high-performance systems are extremely versatile, and Fred’s is one of a limited number of Premium Installers listed on Unico’s website serving the Omaha area. Unico heating and cooling systems fit in any space, run extremely quiet, provide maximum efficiency, and remove up to 30% more humidity in summer months when compared to conventional heating and air conditioning systems. Learn more about our Unico solutions by calling Fred’s Heating and Air today or click here. No Existing Ductwork? No problem.